Danny L Harle is a pop producer, classical composer, and key member of London-based record label/collective PC Music. When PC Music assimilated themselves into the mainstream thanks to a major label deal with Columbia Records, it was Harle’s sugar-sweet single “Broken Flowers” that led the way forward, making its way onto the BBC Radio 1 A-list and notching up close to a million plays on YouTube. Caroline Polachek, meanwhile, is a singer/songwriter/producer best known as one half of Brooklyn electro-pop duo Chairlift alongside her musical partner Patrick Wimberly. Polachek has produced some astoundingly forward-thinking pop songs both with Chairlift and under the name Ramona Lisa, and she’s taken those talents behind-the-scenes, working with huge pop stars like Beyoncé. Harle and Polachek have a lot of things in common: both are some of the most technically accomplished musicians in the game, both are driven to take pop music in new directions, and both have a genuine excitement about working with pop stars (Polachek co-writing songs like “No Angel” for Beyoncé, Harle working with artists like Carly Rae Jepsen). 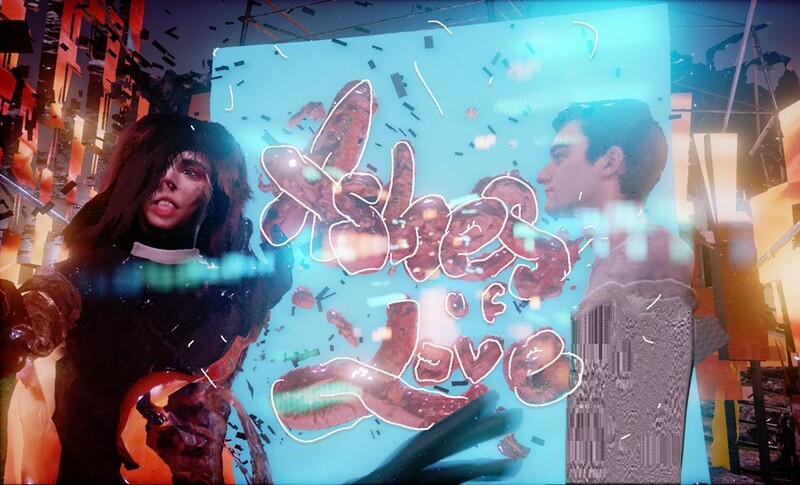 So it makes perfect sense that they’d team up on “Ashes of Love”, a song that pairs Harle’s high definition production and extreme pop tendencies with Polachek’s unique vocal melodies. Depending on how you look at it, the CGI-heavy video for “Ashes of Love” is either a visual spectacular or a spectacular eyesore – but it’s a video befitting of a song so big and so now. Directed by artist/designer Sam Rolfes of Join The Studio, it depicts Polachek dancing (virtually) and singing (IRL) along to Harle’s music. Watch it below, and read on for a fascinating, sometimes ridiculous email exchange between the two artists discussing their joint interests in the Japanese pop industry, the Eurovision song competition, EDM, and the future of electronic music. Danny L Harle: We appear to have very different approaches to songwriting – you’re more organic and voice-led, while I tend to be mechanical and production-led. That said, I found it very easy to write with you. I feel that it was because we share a mutual interest in specific styles of melody (as I deduced from hearing the stuff you make with Patrick)... Or were you just being nice and working around my style? Be honest m8. Caroline Polachek: Yes, when I come up with ideas on my own, it’s almost always a melody, just as often an instrument or bassline as it is a vocal. But it is a single, linear, monophonic thing. Something you could hum or whistle. Often those get brought to Chairlift and fleshed out, but when writing from scratch, Patrick and I very often start with chords and beats, so working with you this way was a familiar process. I found it interesting that you and I have a very similar rhythm in the studio: we both like to hear something back for the same amount of time, critique for the same amount of time, tweak for the same amount of time, and that allowed us to throw ideas back a forth at quite a high speed without having to think about being polite. I suppose the song isn’t very polite either. You've mentioned a few times that the Japanese version of ‘I Belong In Your Arms’ is what made you reach out to propose working with me. Did the fact of it being in Japanese make you like the song more? No shame, bruv. Danny L Harle: The fact that it’s in Japanese is definitely the reason I initially clicked on the YouTube link! I guess the fact that it was in a foreign language made me concentrate on the melody, which is a HUGE banger. I like the English version too but I guess I just got attached to this version first. Caroline Polachek: I've noticed on your Soundcloud, you've separated your music into ‘Pop’ and ‘Classical’, although your classical music is all electronic and sounds very current. What’s the fundamental difference to you between the two? Danny L Harle: I made the two playlists while I was studying classical composition, which made me think very divisively about music. I should really get rid of those playlists. I've noticed that you have said that you grew up liking music which is sung in languages foreign to your own – could that have influenced your more experimental approach to vocals? (Using extended techniques, unusual phrasing, etc). Caroline Polachek: Definitely – it made me sensitive to how tone ‘speaks’. But I’m also extremely sensitive to lyrics, and annoying lyrics can ruin a song for me (and likewise, incredible lyrics can make a song for me). But there are lots of people who don’t notice lyrics at all. I find it inspiring to also consider them when singing. When I hear singing in foreign languages, it’s more like watching a dance, and is often richer or more transportive for me than hearing music in English – which isn’t very fair, is it? Danny L Harle: I think people often having trouble listening to electronic music because there’s no clear visual means of sound production, and that makes it less relatable. I think this will change! What do you think about this? Caroline Polachek: There’s a Phillip Glass quote I read somewhere (and now can't find anywhere) that went something like this: when asked what the future of music will be, he responded ‘people singing and hitting things’. I think electronic music will always come back to those two impulses, whether or not it’s a program doing the hitting and singing. But it’s interesting to hear that you’re concerned about relatability. It seems to me that young listeners now have a clear (if not over-simplified) idea of how electronic music is made because they grew up with GarageBand on their MacBook, they have a friend who makes beats on Ableton Live, they DJ off their iPhones, etc. But it’s also true that the same sound can come from a million different sources now, and it keeps changing so fast that there’s no one correct way to contextualize it. What do you think about the Zac Effron DJ film that came out last year, We Are Your Friends? Danny L Harle: It has the best trailer to any film I have seen. I made a mashup of that trailer with clips of Danny Sunshine last year and it worked really well. It exemplifies the obsession with EDM that is sweeping the world. I love EDM, it’s absurd but also occasionally strikes a really odd emotional chord with me in a HUGEST way. Something I really like about Japan is that their mainstream occasionally contains fake or animated popstars. For me, this is evidence that in Japanese popular culture there is more of a willingness to allow mechanically produced sound to make you feel actual emotions. What do you think about this? Caroline Polachek: I think Japanese audiences are a good decade ahead of western audiences with their openness to synthetic stars. Ultimately, some of the biggest human pop stars aren’t very different, inasmuch as they have huge teams of artists creating their work behind the scenes. But synthesizer music has been accepted as emotional for long enough that it isn’t a huge reach, conceptually, to think of a fake voice as ‘emotional’, especially since there’s a human composing it. Once we have algorithms writing the music itself though, it’s a different story. I think about that all the time actually, ‘cause it shows how the most legendary human stars all have this mixture of perfection and frailty. The way they offer a coping mechanism for living. AI composers can’t possibly offer that, but perhaps there will be something just as profound there. Pure chaos, or pure innocence? What’s your opinion of Hatsune Miku? Danny L Harle: Obv a big fan, can’t say I’ve heard any HUGE bangers come from her though, which is ironic as she has had more songs written for her than any pop star ever. Do you think you could move back to Japan? Caroline Polachek: The language barrier is a big hurdle. I lived in Belgium for a year when I was 19, and was really depressed until I really got a handle on speaking French. I would love to live in Japan again, but would need to really commit to learning the language before doing it. Both my parents speak Japanese fluently, so I suppose it would feel like a tradition. 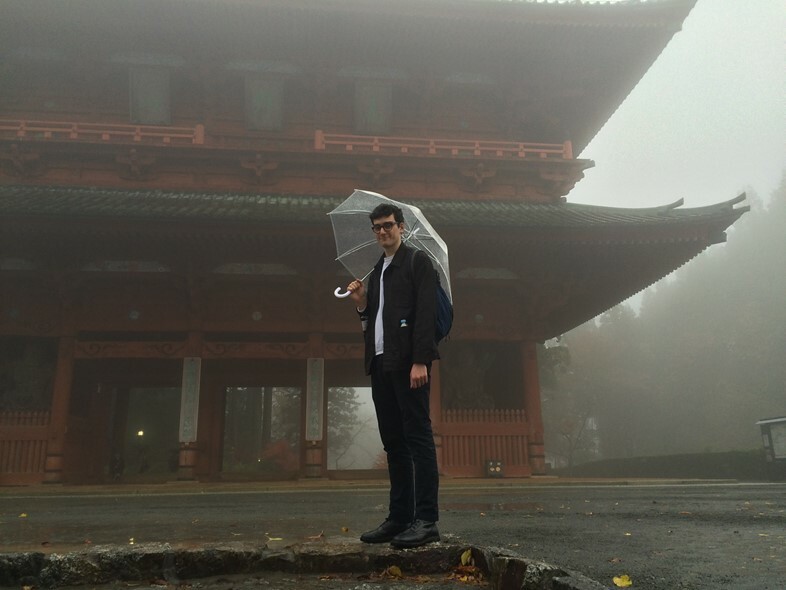 Danny L Harle: I’ve attached a photo of me in Japan at the top of Koya San, do you have any photos of you in Japan? Caroline Polachek: Here’s one of me when I was last there, in 2012. There are so many great ones of me as a kid in the 80s – I wish my mom wasn't on a trip this week so I could ask her to scan some for us! Danny L Harle: What do you think about Montenegro’s 2012 Eurovision entry? Caroline Polachek: Woah, I didn't know about this at all until looking it up just now. Now I’m down a YouTube rabbit hole of watching Rambo Amadeus interviews. The man is a genius. Somewhere between Jodorovsky and Weird Al? “It is Trojan donkey, not Trojan horse. Nothing comes out.” Incredible. What would the Danny L Harle Eurovision performance be? Would you troll or make it beautiful or both? Danny L Harle: I love Eurovision so much. It truly will be one of my career peaks to enter it. I would prefer to enter for another country though, as although I love Graham Norton’s commentary on the contest I don’t appreciate my country's general attitude to it. I think my performance would be in nearly complete darkness with multiple glowing singers in different corners of the room. At the end of the performance, all the singers would fly onto the stage and slowly disappear into a mysterious ocean of tar or something. How did you think people would respond to ‘Ashes of Love’? Are you able to gauge what the response is going to be to music that you have been involved with? Caroline Polachek: ‘Ashes Of Love’ has much more hot-blooded vocal than what PC Music is known for, and a much harder production than what I usually do, so I was fully prepared for people to hate it. But I had my bets on people loving it. I’m not great at gauging what passes for pop – I get surprised all the time. I love that, really – it keeps you from ever getting too comfortable or relying on a formula. There isn’t one.